I really feel this post needs little introduction. Real Custard is something my childhood missed. 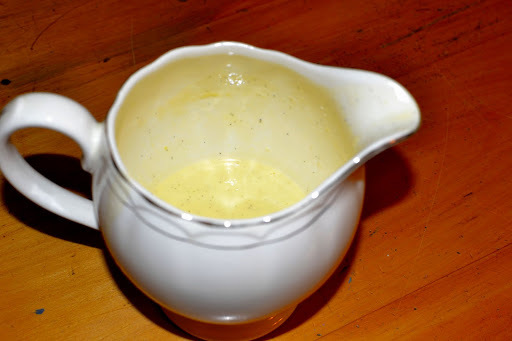 My memories of custard as a child are either Ultramel from a box or homemade ‘Moirs’ custard resembling a bright egg yolk with the thickest skin imaginable – the kind that when you tip the jug the skin falls into the bowl in a whole piece. (Just thinking about it now makes me slightly nauseous.) Fortunately I now know better and as chief cook in resident I never have to eat custards like that again (although I will admit to being partial to Ultramel under certain circumstances). Real Custard (spelt with capital letters so that you appreciate its significance and importance) is light and creamy and vanilla-y and yummy. I like my custard cold but if you’re partial to hot custard you can eat it pretty much from the pan. It makes a great addition to various desserts… the butterscotch pecan bars listed here, tinned fruit, stewed fruit, ice-cream, jelly, hot desserts, cake. You get my drift. I’m a big Real Custard fan. But I am also the type of person who can eat the whole jug of custard without sharing so there you go. Maybe you don’t feel exactly the same way. Shame. I think I have written enough on the values of this Real Custard. Here is the recipe. Heat the milk and vanilla until scalding point. Whisk the yolks and the sugar together. Pour some of the hot milk into the yolks and whisk. (Tempering.) Pour the mixture back into the milk and give it a whisk to make sure everything is combined. Then stir with a wooden spoon over a medium heat until the custard coats the back of the spoon. Strain into a jug and cover the top with some cling wrap if not using immediately. Will survive 3 days in the fridge. This recipe works (as maybe you’ve guessed) in 10% increments. 4, 40, 400. So you can use pretty much any incarnation of this formula. (2, 20, 200 or 8, 80, 800) The amount made here provides enough custard for about 8 if serving with a dessert.